Materials science—an interdisciplinary research enterprise—looms large at Purdue University, home to top-ranked departments in science and engineering. The Chemistry Department plays a central role in creating advanced materials and composites that address real-world challenges and opportunities such as energy conversion, flexible electronics, drug delivery, and sustainability. The synthesis and analysis of novel materials employ many of the same experimental methods used in inorganic, organic, and physical chemistry. For this reason, Purdue's Chemistry department offers a graduate program that provides flexibility and depth to support interdisciplinary research and training, as well as solid foundations in mainstream areas of chemistry. Purdue Chemistry offers exciting research projects on nanostructures, polymers and soft materials, self-assembly, surface chemistry, and simulation and theory. 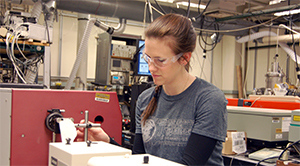 State-of-the-art equipment for materials characterization are housed in the Jonathan Amy Center for Chemical Instrumentation, as well as other research centers at Purdue such as the Birck Center for Nanotechnology. Students have access to facilities for chemical imaging by electron microscopy, wide-angle x-ray diffraction analysis, surface metrologies such as AFM and XPS, and a variety of tools for testing electronic, mechanical, and optical properties. Jianguo Mei designs electronic polymers (e-polymers) at the molecular level to manipulate their optical and electrical properties for high-performance organic electronics. π-Conjugated molecules and e-polymer composites are being transformed into thin-film energy devices such as organic solar cells, polymer-based batteries, and field-effect transistors for chemical sensing. Organic and polymer synthesis plays a critical role in materials development, which is supported by physical characterization and device fabrication to establish relationships between molecular structure, synthetic methodology, materials processing, and device performance. Bryan Boudouris designs functional polymers that can be fabricated into flexible, mechanical robust, thin film devices for energy conversion and storage, water purification, and homeland security applications. Emphasis is placed on controlling the macromolecular architecture of designer polymers in order to control nanostructured features and end-use performance characteristics. Christina Li’s research focuses on defect-rich materials as heterogeneous catalysts for the conversion of C-based fuels and waste CO2. Metal alloys, mixed-metal oxide, and chalcogenide frameworks with tunable defect chemistry are utilized to create unique surface redox and binding properties for C‒H activation and CO2 adsorption. Synthetic variation allows us to build structure‒activity relationships for these complex defect surfaces, in order to elucidate general principles about heterogeneous activation of strong C‒H and C‒O bonds. Corey Thompson’s research program focuses on developing novel functional inorganic materials for applications in energy generation, conversion, and data storage. Current interests include designing earth-abundant magnetic refrigerants, polar transition metal oxide materials as magnetic sensors, and atypical cage-like intermetallics for thermoelectric devices. Rational design of such materials can be achieved on the basis of understanding the structure-property relationship. Chemical modifications within the structural motif can afford the optimization of the material’s physical properties. Libai Huang uses ultrafast spectroscopy and scanning probe microscopy to study fundamental mechanisms in architectures that harvest solar energy. Optical imaging methods that combine ultrafast time resolution with nanometer spatial resolution enables her group to generate spatial maps of carrier dynamics, to identify correlations between structure and energy or charge propagation. Jonathan Wilker develops polymeric materials with high adhesion strength, inspired by the abilities of mussels, barnacles, and other marine organisms to affix themselves onto the ocean floor. As an example of a biomimetic adhesive, polymers with pendant catechol units can be cross-linked in a manner similar to that of DOPA-containing adhesive proteins produced by mussels, with adhesion strengths rivaling that of cyanoacrylate “super glues.” These synthetic polymers are currently being developed into surgical adhesives, bone cements, glues for wet surfaces, and non-fouling coatings in water. Chengde Mao’s research focuses on the self-assembly of DNA and RNA nanostructures. These molecules have specific and programmable recognition based on simple basepairing rules (G-C and A-T/U), and their predictable assembly into double helices and other secondary structures. DNA and RNA nanostrucutures can be engineered into robust frameworks and devices, with application as scaffolds for organizing other biomacromolecules, nanodevices with electronic and optical properties, probes of intracellular processes, and vehicles for drug delivery. Alexander Wei creates functional materials at the interface of organic and inorganic chemistry, including novel nanomaterials for sensor applications and drug delivery. Projects include designing nanostructures with hybrid optical and magnetic properties, metallized graphene nanopetals for electrochemical catalysis, and cellulose nanocrystals as a biorenewable feedstock in thermoplastic films. An important feature of these projects is the sustainable production of nanomaterials from earth-abundant resources. Jean Chmielewski develops novel soft materials for tissue engineering and drug delivery applications. 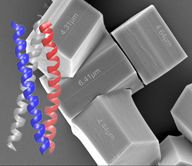 The designed materials use peptide-based scaffolds containing higher-order assembly signals for control of structure. In this way they have developed nano- to micro-scale fibers, disks, hollow spheres and three-dimensional meshes through hierarchical assembly. Shelley Claridge reenvisions the amphiphilic architecture of phospholipids in biological cell membranes as a highly evolved framework for creating high-efficiency nanostructured electronic and optoelectronic materials for synthetic devices. Taking lessons from nature in areas ranging from precise sub-nm spatial organization of functional groups to supporting charge separation near low-dielectric environments, students develop and use skills ranging from nanoscale characterization to organic and inorganic synthesis and computational modeling to create new interfacial architectures. Tong Ren studies the use of metal‒acetylides as the active components in electronic and optoelectronic devices. Examples include molecular-scale wires, electrical switches, and molecule‒semiconductor junctions. Diruthenium‒acetylides have been incorporated into Si nanowire field-effect transistors to create non-volatile memory devices with excellent stability (> 109 P/E cycles). 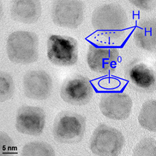 Similar studies based on 3d-metal‒acetylides are ongoing. David Thompson's lab develops bioresponsive materials— lipid conjugates, polyrotaxanes, self-assembling copolymers, and templated nanoparticles—as carrier systems for drugs and nucleic acids, and as contrast agents to evaluate the pharmacokinetics and fate of these materials in vivo. Synthesis optimization and materials characterization are fundamentally important for the design of effective carrier systems. We also design affinity materials that can simplify sample preparation for protein structure determination, using single-particle reconstruction techniques by cryoelectron microscopy. Sabre Kais: Theoretical and computational methods for coherent energy transfer in novel excitonic materials, for solar energy applications. Gudrun Schmidt: Making new materials from renewable polymers. Mary Wirth: Polymer-modified colloidal crystals for ultrahigh performance chromatography of protein isoforms.